A woman's gown of sky-blue silk damask woven in a serpentine trellis pattern and large floral motifs. The gown is in the English style, open at the front with elbow-length sleeves. The bodice and sleeves are lined with linen. The pleats are the back are stitched down; the skirt finely pleated into the waistseam. The gown is made of 5 widths of silk. It was probably first made into an English gown in the 1750s, and updated and adjusted for size in the late 1770s; pleats for a similar style back are still visible. The sleeves were modified to a plain curve at the elbow. 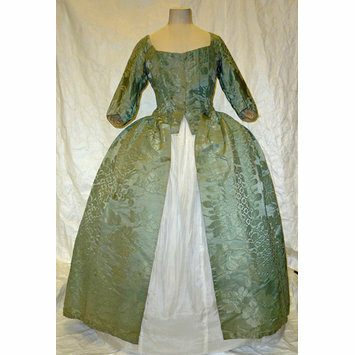 The robings were unpicked, and pieced to allow the bodice to meet at the centre front. The waistseam was probably unpicked and the skirts pleated more finely and held in place by stitching 2.5 cm below the seam. The bodice side seams were taken in. Further alterations were made for fancy dress in the late 19th century. Hooks were added to the right front and thread bars to the left front, and a casing with drawstring at the top. Linen tapes were sewn to the seams about 20 cm above hem on the inside and at the waist, in order to loop up the skirts. The side, back and waist seams have been unpicked in areas to make the gown larger and darts added at the waist to fit it to a late 19th century corset. 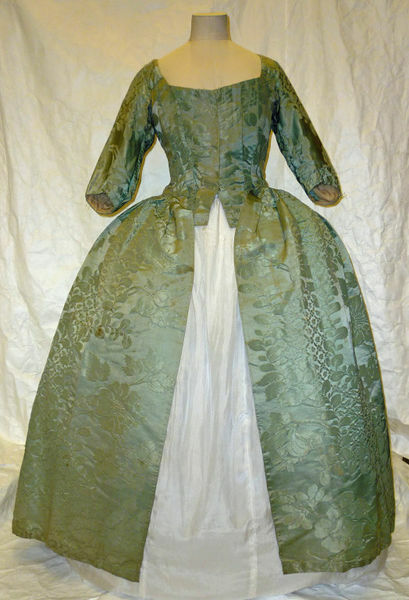 The gown was originally made from a blue silk damask designed by Anna Maria Garthwaite. The design, museum number 5985.21, is inscribed "Mr Palmer Mr Vautier March 16 1747".